We're in the midst of Afternoon Tea week (August 14th - 20th), a time to sip on a cuppa and indulge in scones slathered with clotted cream and jam. Which do you spread first (that old age debate)? There are tons of places across the capital to enjoy this quintessentially British treat: here are a handful of our top picks, ranging from super-traditional to something a bit quirky, across a mixture of venues. The menu at this Mayfair institution faithfully follows the traditional combination of sweet and savoury. The ingredients include British specialities such as poached Scottish salmon , whilst the pastries change with the seasons. The heart of the experience is the drink itself – from a rich Oolong to the refreshingly complex Claridge’s Blend, the teas complement the food perfectly. The English ritual (dating back to 1840), with a twist of Claridge’s creativity. Madder Hatters: tumble down the rabbit hole and discover a tea party beyond your wildest imagination, inspired by the whimsical world of Alice in Wonderland. With menus hidden inside vintage books and teapots adorned with kings and queens, the afternoon is full of tantalising treats, including melt-in-your-mouth ham and Parmesan croque-monsieur and Queen of Hearts rose and strawberry jammy dodger. Wash everything down with Alice’s Exotic Fruits “Drink Me” potion and a glass of Laurent-Perrier Champagne for good measure. An excellent choice in the heart of the West End. 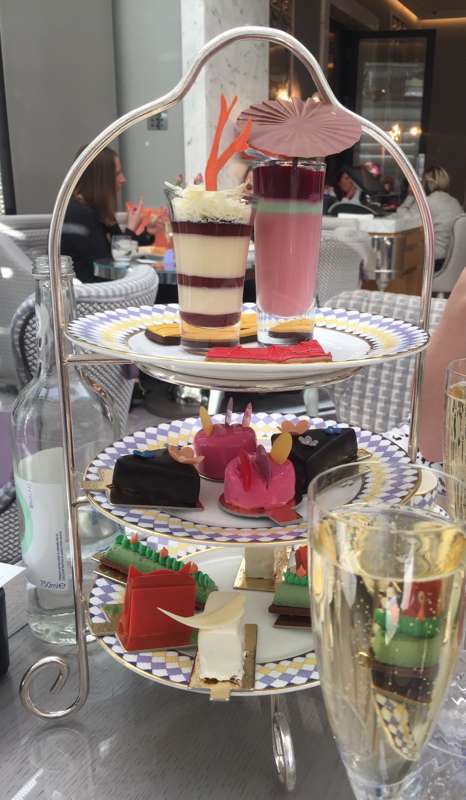 Head to Knightsbridge for Prêt-à-Portea, a designer afternoon tea inspired by the world of fashion. The menu of couture cakes gets a makeover every six months to reflect the latest catwalk trends, colours and designs. Whatever the season, there'll be exquisite biscuits, bakes and fancies. It takes inspiration from a selection of distinguished fashion and accessory designers, and the latest creations shown on the international runways. How does a plant-based offering sound? Get that exactly that at this west London eatery. Their vegan high tea features a range of plates, such as basmati and coconut truffles, layered strawberry and cashew mousse and pulled jack fruit taco with chilli and coriander. To drink? Sup on hemp leaf tea or a rose and raspberry infusion shaken with artisinal local vodka and lemon. Indulge in a slice of one of the finest British traditions and take afternoon tea at The Ritz in St James's. Enjoy a selection of finely cut sandwiches, freshly baked scones with Cornish clotted cream and strawberry preserve, and a mouth-watering range of pastries and teacakes. As well as 18 different types of loose-leaf tea to choose from, why not sip a glass of fizz to add some extra sparkle to the occasion? It's the only hotel in the UK to have a certified Tea Sommelier, who travels around the world to various plantations on research and sourcing trips. Take the weight off in north London's grand station, instead of just rushing through it. The stylish space is part shop, part restaurant; for afternoon tea they serve delicious morsels such as rare breed hen egg sarnies with mustard cress on poppy seed bread and old school coronation turkey on wholemeal. To finish? Gorge on passion fruit and coconut with shortbread. Yum. How about combining science and afternoon tea? This is a one-of-a-kind experience, and unique to the Kensington hotel. The inspiration came from the museum, just five minutes from their front door. The aim? To experiment with sounds and visuals, making each experience interactive. Expect a mix of exciting and curious dishes, from jams served in petri dishes, to chocolate spacemen and dinosaur biscuits. Head to Seymour's Parlour at the Marylebone offshoot or the Cocktail Lounge at the Clerkenwell outpost of this independent collection of hotels; both are equally lovely rooms. Choose either Aunt Wilhelmina's menu, with smoked chicken Caesar and roast ham or Uncle Seymour's, with devilled eggs and sausage rolls. The establishments have bags of personality and pioneering eco-credentials.